I'm a very dutiful reader. I feel that if the writer of a novel wanted me to know something BEFORE I read her book, she'd have put it in a note at the front. 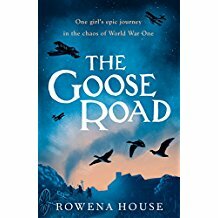 Rowena House has put her historical note at the back of the book, with the result that it came as a wonderful surprise to find out about the things that led her to write this story, which is published in April. The image above is from the bound proof which I read. This year marks a century since the Armistice after the War to End All Wars. It hasn't turned out to be a peaceful century, of course, but this book takes a part of the world (Northern France) and a very well-documented and written-about conflict and tells the kind of story we haven't often seen in this context. It's mainly a story about a family and about a way of life. The Lacroix family have a farm called La Mordue and Angélique finds herself, right at the beginning, facing the death of her father in the War. This, because of the kind of man he was, she regards as something of a blessing. He was cruel and abusive to her, to her mother and to her brother, Pascal, who is also away at the war. Because of what emerges about her father after his death, and because the bailiffs are about repossess the farm, Angelique takes her beloved flock of geese, (including her special favourite, Amandine and the formidable gander, Napoleon Bonaparte) and begins a journey through the war-scarred countryside to sell them to Marshall Foch in order to get enough money to save the family farm. Things, naturally, do not go according to plan and her adventures form the greater part of the story. The book takes the form of a quest. Angélique is looking for money but finds many other things along the way. Most importantly, she meets Uncle Gustav and he takes her to his own home, to meet again a person she'd previously misjudged, her Aunt Mathilde. Angélique, like all heroines of novels involving a journey, learns much along the way. She loves a young man called René and is convinced that both he and her dear brother Pascal are safe and sound, in spite of all the carnage. She learns about what war can do to a man, even one who doesn't have half his face shot away. And she learns that cruelty and abuse is something that gets handed down through the generations. I won't spoil anyone's pleasure by detailing her adventures, but there are many incidental pleasures to point out. One of the things I enjoyed most was the description of the geese. It's an irony, I suppose, that Angelique is fully intending these geese to be eaten even though she loves them so much, but she's practical as well as a dreamer and that's how things are. Geese are for food. Still, the reader gets to love the creatures too and we're sad as readers when any of them dies. There's also a good description of the way war carves out horrors on a quiet town and its inhabitants. Descriptions of wounded and damaged men abound. The war is not only on the battlefields, not only in the sounds of mortar and shell but also in the howls of sorrow and pain coming from the civilian population and those who've escaped from the fray into a lifetime of being haunted by what they witnessed as they fought. I hope that everyone who reads it enjoys it as much as I did. I think it would make a very good addition to the library of any class studying this period in our history. And when you do get to the end, you'll be as interested as I was to read about the inspiration behind this thoughtful and intelligent novel. Thank you so much for such a thoughtful & kind review. I'm delighted you enjoyed it. I've also read a proof copy of this story - loved it, and agree with everything you say, Adele. Thank you, Ann. That's wonderful to know. Great review of what promises to be a wonderful read.